Diamond Head are in a small handful of what could be considered quintessential NWOBHM bands. Unlike Saxon, Iron Maiden, Venom, Def Leppard, and Samson, amongst the most well known NWOBHM bands, Diamond Head never seemed to get their due attention. Had Metallica not covered five (four of which made the Garage Inc. compilation) of the seven songs from Lightning to the Nations, it's conceivable that Diamond Head would have gone largely unknown outside of England forever. To a degree, I feel that Metallica reaped undue success from their Diamond Head and Blitzkrieg covers, but at the same time, it did give exposure to some great NWOBHM bands that very likely would have gone totally ignored otherwise. So with that, I guess it's a double edged sword when you look at Metllica's worship of Diamond Head, and to a lesser degree Blitzkrieg. To his credit, Lars Ulrich did put together a 2 CD compilation in 1990 featuring a 30 track, 29 band sample of the NWOBHM movement. Yes, Lars has become a laughingstock in heavy metal circles over the past few years, but this is a great place to start for those who may not know much about the NWOBHM scene, and wish to hear many bands at one time to get your feet wet. Of course, the one band to have 2 tracks on this compilation is none other than Diamond Head. To that, Lars comments in the liner notes, "Oh… Why 2 Diamond Head tracks? Listen to them and think about it!" Amen. Diamond Head was formed by Brian Tatler in Birmingham, England. Sean Harris landed the lead vocalist part through auditions. Duncan Scott joined to handle duties behind the kit, and Diamond Head was born in June, 1976. Bassist Colin Kimberly was brought into the band shortly thereafter. 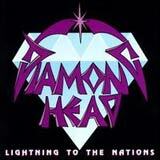 This lineup of Diamond Head recorded Lightning to the Nations and Borrowed Time together. Lightning to the Nations was originally released on an independent label, Happy Face Records in 1980 with very minimalist (all white, plain sleeve with the band's signatures on it; no track listing or album title!) packaging. As a result, this album is frequently referred to as "The White album." Diamond Head was signed to MCA prior to the releases of Borrowed Time. During the recording of Canterbury, Colin Kimberly and Duncan Scott left the band, and were replaced by Mervyn Goldsworthy and Robbie France. After the release of Canterbury, MCA dropped the band. Not to be stopped, Diamond Head went on a self financed tour in 1984. They partially completed an album after that, but disbanded before the album could be completed or released. In 1990, Sean and Brian reformed Diamond Head. In 1992, the band finally released another studio album, Death & Progress, but disbanded yet again. Several years later, Diamond Head was reformed by Brian and Sean, with a rumored album to have been completed, but not released some time around 2003. In 2004, Sean Harris left the band amicably, and was replaced by vocalist Nick Tart. That brings us to present day Diamond Head, who have released their latest studio album, All Will Be Revealed in late 2005. As for Lightning to the Nations, this album is without a doubt a short, but sweet NWOBHM classic. This album captures everything that is great about the NWOBHM movement: raw power, energy, speed, and in your face guitars. Lightning to the Nations features heavy Black Sabbath influenced riffs, lots of power chords, and even some progressive rock elements such as time changes and complex rhythm sections. The band wastes no time in hitting the listener with some time changes and complex songwriting with the opening, title track of the album. Power chords from the opening seconds of the songs and the soaring vocals of Sean Harris really help to define this song, as it is one of the least catchy of the album, but ahead of its time as far as songwriting goes. Despite some complex arrangements and time changes on the album, Brian Tatler had a great sense of melody in his guitar playing, ensuring that each of these songs would be memorable listens on many different levels. Sean Harris is a charismatic, powerful vocalist that was able to belt with conviction to Tatler's thundering riffs, yet could haunt you with a restrained delivery in the lower octaves as well. The Prince is an excellent example of Harris's vocal dynamics at work. Also at work at this tune are some dynamite and unforgettable, extended leads that would certainly influence Iron Maiden, backed by an embellishment of scorching solos and shreds, as was a staple of the NWOBHM era. Sucking My Love (easy to guess what this song is about, huh?) is backed by instantly recognizable, Sabbath like riff through its duration, but has an interesting, atmospheric break in the middle of the song that concludes with a thunderous rhythm before leading back into the main riff once again. An extended solo ends the song, concluding what is very dynamic song in terms of songwriting. I suppose the band's intention here is a tongue in cheek recreation of the build up of energy and subsequent release while one is "sucking their love." Am I Evil? is dominated by a heavy, yet sinister riff and rhythm work, accentuated by Sean Harris' repeated "Am I Evil? Yes I am" lyrics. Some extended soloing captures the energy and fury of the song as well. Sweet and Innocent is the most accessible of the songs on this album. Sean Harris puts forth an inspired vocal delivery, backed by a more laid back power chord rock rhythm and tempo. The chorus line is almost poppy in nature, due to the thick, harmonized vocals that define it. Still, this atmosphere fits the lyrical content of the song quiet well, and the guitar playing of Tatler refuse to let the song become boring. It's Electic and Helpless conclude the album with perhaps two of the most recognizable metal anthems of this period in metal history. Again, Brian Tatler provides some heavy and forceful guitar work on both these songs that easily get stuck in your memory. Also, some unexpected time changes add something more to the songs. While listening to Sean Harris displaying his range, soaring vocals, and properly placed, more restrained vocals, I realize what a crucial part of the band he was. With due respect to the many classic Metallica songs that James Hetfield brought to us in during Metallica's heyday (ending with the black album), he just couldn't capture the emotion and energy that Harris gave these songs. Lightning to the Nations was certainly one of the most influential and important albums in the evolution of heavy metal, that much cannot be denied. Although there are more recognizable names that came out of the NWOBHM movement, this album was one that really spearheaded the movement, and helped to expand heavy metal in the early 1980's. The band influenced countless other NWOBHM bands during the period, and of course, bands such as Metallica and Megadeth owe a great deal to Diamond Head. Years ago, I remember reading an article in which Lars Ulrich admits that Metallica would not have existed had it not been for Diamond Head. My guess is that many other bands would not have existed either, and the face of heavy metal would have been much different without this band. That's a powerful statement for a seven track, indie release, but one that I believe to be true nonetheless. After writing this review, I can't help but remember a night that I was working in a bar, and playing Blitzkrieg's A Time of Changes album, when the song Blitzkrieg started playing. A bar patron asked me who this band was, and commented that this was a "really good Metallica cover tune." After biting my tongue and laughing to myself, I explained that metal existed before Metallica, and gave him a brief rundown of the gerat NWOBHM era. If your CD collection is missing this album, you are lacking an important historical piece of the evolution of heavy metal.